In my first Dynasty Warriors 8 battle, I killed 1,258 men before reaching the commanding officer. During this long-winded massacre, bodies were flung dozens of feet into the air, multi-colored sparks stemming from clashing weapons colored the sky, and sick hair metal echoed throughout the open plains. All that carnage was achieved thanks to the single general that I led into battle, and not the mindless friendly soldiers that followed close behind. And really, the core of that skirmish felt a hell of a lot like the Dynasty Warriors we’ve all come to know and tolerate over the years. We’ve seen a steady flow of iterations on this same formula since the dawn of the PlayStation 2, and in most cases the individual elements haven’t been polished quite enough to warrant even the most die-hard fan’s attention. Everyone outside the franchise’s influence has likely forgotten the power struggle between the Three Kingdoms even exists, but somehow, developer Omega Force’s latest attempt at glory warrants your attention. Even if it’s still a testosterone-fueled power fantasy that threatens to wear out your valuable button-mashing finger, there are enough upgraded systems and addressed issues to make the eighth entry in this once-mindless series a worthwhile venture. Don’t think a better game means fresh threads to the plot, though. This is still a retelling of ancient Chinese warfare, following the military affairs of the four main kingdoms of Wei, Wu, Shu, and Jin. Each of the four bundles of missions takes place during the Three Kingdoms period, where you’ll be faced with betrayal, romance, and overzealous monologues from generals with fantastic mustaches. There are also additional stages for each of the characters who refuse to swear allegiance to any of the major powers, giving the game a story mode that will take many hours to comb through. By the end of a single playthrough, it’s unlikely that all the content in a single kingdom’s story will be seen. Secret objectives can be found in specific locations during battle, leading to new story beats, fresh generals to do battle with, and the appearance of all-new chapters. The levels remain largely linear, as the different paths on the open plains all funnel into a final encounter, but the optional goals are a nice change of pace for a franchise that’s played it straight for so many years. One of the other bonuses of completing these secret objectives is the ability to play different sets of warlords in subsequent battles, and while that may not sound like too great a prize, the wholly unique move sets and techniques that each character possesses makes swapping your player-character a joy. Instead of seeing three or four basic archetypes stretched across dozens of distinctive faces, each personality enjoys different combination attacks and special Musou techniques. Tedium can still creep up during the average battle, but testing out each character’s skills goes a long way to mix up the action from level to level. The abundance of ancient Chinese weaponry allows for a great deal of combination creativity. Players can take two weapons into each battle, with particular characters holding affinities for different blades. A bigger, stronger officer will likely prefer using a hefty club, giving him or her stat bonuses during battle. The standard attack combinations, which are simply tied to a two-button system, are different across each weapon type, so as long as you’re willing to try all the new pieces of equipment you either buy from a blacksmith or gather from a fallen enemy, you’ll rarely grow tired of the moment-to-moment action. 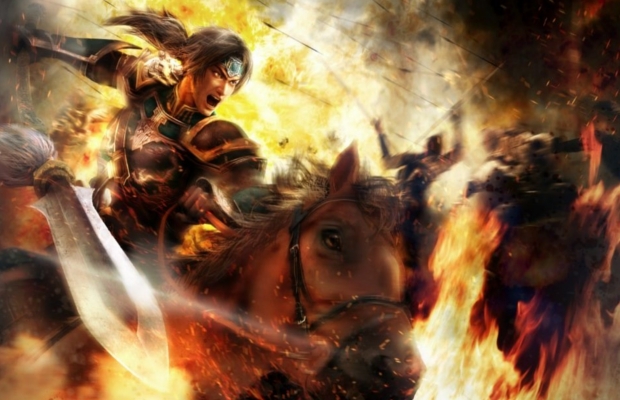 Interspersing Musou Attacks, as well as a Rampage state that significantly increases an officer’s aptitude for a brief period of time, also helps to maintain player interest. Other than the Story mode, players can indulge in either the Free or Ambition modes. The first is a simple way to replay past battles fought during the available campaigns, allowing for additional level grinding and tactical experimentation. Ambition mode, though, throws your officer of choice into an underdeveloped, militarily weak kingdom that’s in need of some assistance. The player’s job is to fight multiple skirmishes, gain fame through dominating opposing forces, and build the upstart kingdom into something even the emperor would be proud of. Materials gained from battle can be used to upgrade different facilities, and key warriors from the game’s Story mode will occasionally join your cause. It’s a nice alternative to the incessant hacking and slashing seen in every other feature, but you’ll still spend chunks of time emptying enemy camps of anything wearing armor. Even though the game’s overall scale and number of on-screen soldiers can be staggering, Dynasty Warriors 8 is not a pretty game. Environmental textures are flat, character detail is often simplistic, and honestly, you’ll run into some of the worst-looking fire to appear on modern consoles. However, the visual tradeoff helps the game run smoothly for the majority of the time – even when hundreds of enemies are flooding a single location. A well-timed swipe can send more than 50 armed foot soldiers into the distance, and even when accompanied by an online or local cooperative partner, the game continues to maintain a steady framerate. It may not be a pretty face, but what the developers are able to accomplish on a technical level is truly impressive. Really, we should all take a step back and appreciate the fact that Dynasty Warriors 8 is actually a game worth playing. The robust Story mode, lenient free roam feature, and creative addition of the Ambition stages gives players what feels like endless hours of gameplay, and thankfully, it’s easy to stay interested throughout. Character progression, as well as purchasable weaponry, helps to add a purpose to combat that could almost be accomplished on autopilot in the past, and the sheer number of enemies that appear without forcing the game to come to a complete halt is remarkable. At its core, this is still the same Dynasty Warriors that’s been iterated on for years – warts and all. However, the individual pieces have been polished well enough to make the final product the best we’ve seen from this long-running series. Dynasty Warriors 8 was developed by Omega Force and published by Tecmo Koei. A PS3 copy of the game was provided for review purposes.